My son rolled a five. I could see that would put him on the longest "Chute" down to the beginning of the game (again) when he was so close to winning and finishing this interminable game. So when he miscounted and went a square too far, I said nothing. Can you blame me after 25 minutes of one Chutes and Ladders game? That said, you should know that I love games. In fact a trip to a resale store can be dangerous for me as I buy more games than we can ever play! Those kiddie games are good for so much! 1. Connecting: My husband and I have recently started playing Ruzzle® on our tablets. We often play for 15 or 20 minutes each night and the only conversation that goes between us is, "I lost again?" "Where'd you get 'solver' from?" Not exactly a game that connects us. 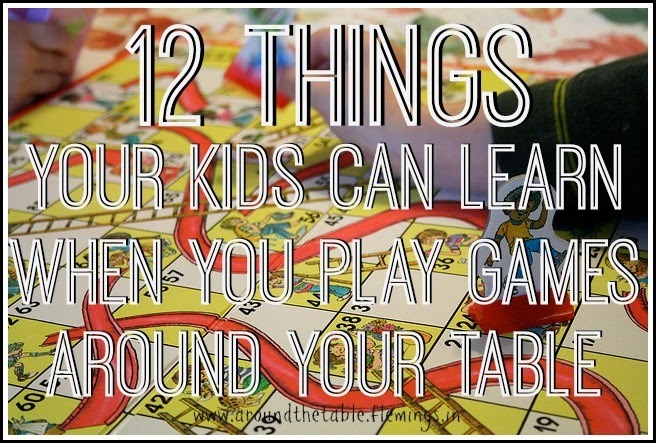 But a table game, especially a child's game, gives a lot of opportunity to connect. You can talk between turns while you are both concentrating on something else. Even if the conversation isn't deep, it provides closeness, a feeling of being worthwhile because someone is spending time with you. 2. Educational: One of the simplest children's games is Candyland®. In this game children don't even need to know how to count, they match colors to move along the board. As the adult or older child playing with them says the name of the color, children as young as three can learn their colors. Later they can learn numbers, counting, and eventually things like deductive thinking! 3. Problem Solving: Ten years ago or so I discovered the solitaire game, FreeCell. After I'd been playing it for a while, I noticed that sometimes I could solve problems using the system I used to win at FreeCell, rearranging things until I could get them into the solution without trying to go directly to the solution. In all games there is a problem--how to get to whatever the goal is. The game allows children to employ and learn problem-solving skills to reach the goal in a risk free setting. Kids who play games will be able to transfer these skills to some of their real life problems! 4. Social Skills: Sometimes I work with children in the schools in our town. I've discovered that a lot of children with difficulties have never had to do anything they didn't want to do. I don't know what their home lives are like, but I'm willing to guess they never had to take turns playing games or learn to lose gracefully among other social skills games teach. 5. Developing Trust: "I paid you your $200 for passing 'Go.'" Are you sure? I thought I had more money than that." Have you ever had a conversation like that? As we play games with our children, they learn to trust us as they see us playing fairly. Then they learn to be trustworthy and trust their friends. 6. Following Rules: My oldest son taught us a card game that had rules, but he didn't tell us the rules. The challenge of the game was to discover the rules by breaking them and being penalized! It was an interesting exercise, but a little frustrating. However playing games does teach our children to follow rules in order to make it fun and fair. 7. Fine Motor Skills: At first just moving a game piece from one square to the next is difficult for little hands. Then they move on to games and puzzles that require finer motor skills and learn them while having fun! 8. Memory: From peek-a-boo to the game of Stratego® memory is involved. This is good for children and adults alike. As we work our memories, our brain stays elastic and we can remember more. Who doesn't want that? 9. Language and Literacy: Every game has its own vocabulary whether it is "candlestick" or "chutes" or " uno" (which, by the way, should be "una"). As our children play, they learn new words. Games for elementary children usually require reading, which helps kids read...if we let them read their own cards. Everyone learns to read by reading! 10. Logic: The game of Clue® might seem simple (okay, you can say "inane") but learning to reason by remembering the clues we find and then paying attention to what others do and say, will teach our children to think things through logically, no matter what you think of the game! 11. Strategizing: My kids loved playing Sorry® and knocking an opponent off the board while exclaiming gleefully, "Sorry!" But they never realized they were learning strategy when they decided whether to move a player to safety or take one out of start. 12. Money Handling: I recently played Monopoly® with a group of mentally challenged students. None of them wanted to "lose" any of their money by buying property. They couldn't grasp the concept, but as we explain and model buying and earning in this and other money games, our children learn to count and handle money wisely. When our family gets together we always play games. Today they require a lot more thinking, but we still get all these benefits! Did you think you were just entertaining your kids or having fun when you played games with your children? Think again. It is time well invested around your table. Yes games were educational. And yes they were entertaining. But now years later, I realize that they spoke into my children's hearts that they were worth spending time with, that they were loved. And we are now reaping the benefits of children (and their families) who want to spend time with us. So much happens when we spend time playing games with our kids :) Happy to be here this morning! Thanks for stopping by. Pass along the good news of the worthwhileness of playing games to young families!